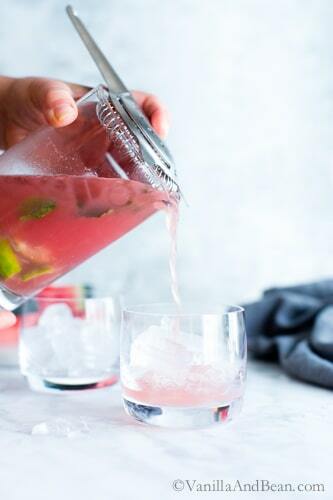 The taste of summer in a scrumptious cocktail; Watermelon Mojitos! This white rum cocktail is easy to whip up and share. Single serve and pitcher ready, for your convenience! The simple pleasures of summer with the anticipation of long weekends, lingering picnics, long beach walks and vacation. These are the things I love most about summer. Too, it’s the fresh produce. 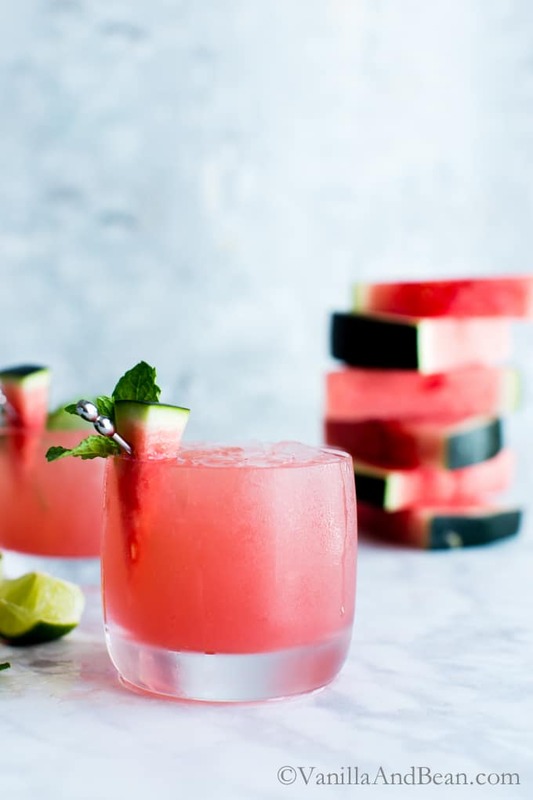 Watermelon hits the top of my list so naturally watermelon mojitos are on the agenda! ...Rob and I celebrated our twenty seventh (!!) anniversary last week! Marriage is a big ole’ slice of humble pie, with patience, endurance and joy mixed in. It’s not always fireworks and butterflies, however. Not the fairy tale image many girls are led to believe. But I didn’t go into this with blinders on. Even my younger self had some wisdom about her. It helps though, to have a willing partner who is ready to grow and share in that juicy slice of humble pie. Someone who’s all in too. Humility. Patience. Communication. Even when you don’t feel like you have the courage or energy in the face of challenge. Twenty seven years seems like a long time. And it is. We were high school sweethearts and decided we’d just see what the future held together. After my first year of college we married and have been sharing this journey together ever since. But really, even if it sounds like a long time, I blinked and here we are. I try not to get too caught up in the amount of time that has passed and simply relish in the celebration of a relationship that’s stood the test of time. One that I’m incredibly grateful for. It’s time to celebrate! Be sure to pick up extra mint for a pretty garnish! I grow a pot of mint for summer entertaining. It’s a fail-proof plant and it’s the one thing the deer don’t eat. The mint simple syrup can be made weeks in advance. I sometimes forget to make it, so after pouring the freshly made simple into a storage container, I pop it in the freezer, unlidded for about 1/2 an hour to cool. 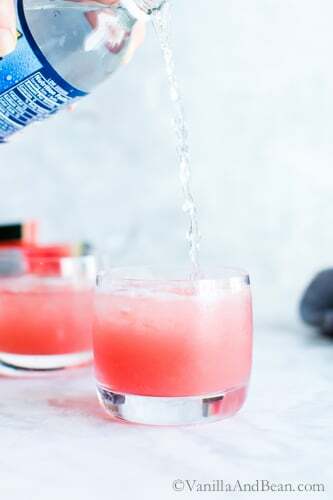 These white rum cocktails are best freshly made and with the juiciest, organic, in season and seedless watermelon you can get your hands on. A trip to the farmers market may be in order! 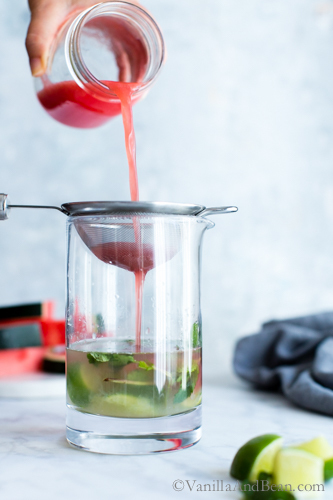 Watermelon mojitos make a fabulous mocktails too. Simply omit the rum and add a bit more club and simple to taste. So here’s to summer, watermelon mojitos and relationships that have enriched our lives, be it friends, relatives or the loves of our lives. Watermelon Mojitos - Single Serving or Pitcher! 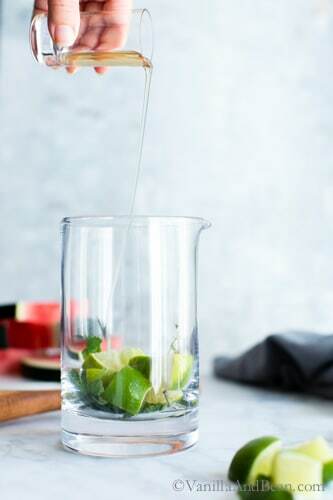 In a cocktail shaker, or cocktail mixing glass, layer the cut lime wedges, and mint springs. Pour in the simple syrup and use a muddler to muddle the mixture for about 30 seconds. The goal is to squeeze out the lime juice and to allow the mint to release its oils. Add the light rum to the muddled mixture, then using a fine mesh strainer, strain in the puréed watermelon (save the solids for a smoothie!). Add crushed ice then shake or stir. Strain into an ice filled highball glass. Top with Club Soda. Stir. 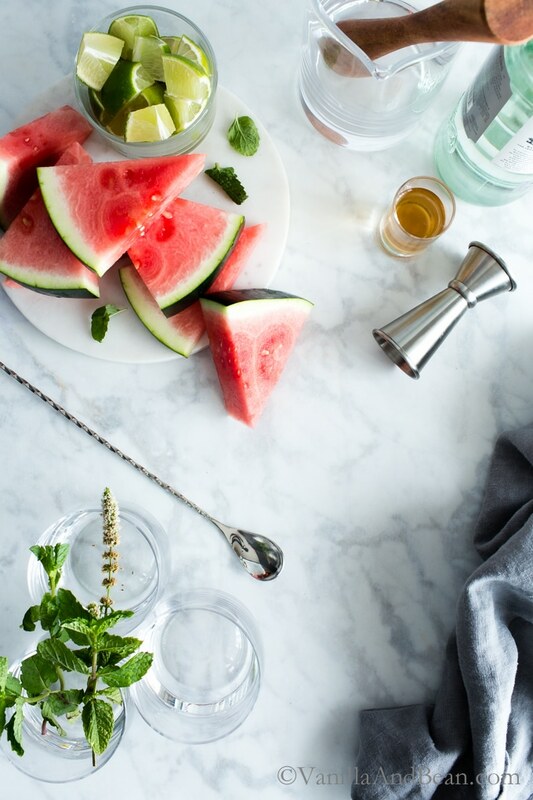 Garnish with a watermelon wedge and mint stem. In a large Ball jar, layer the cut lime wedges, and mint springs. Pour in the simple syrup and use a muddler to muddle the mixture for about 30 seconds. The goal is to squeeze out the lime juice and to allow the mint to release its oils. Add the light rum and to the muddled mixture. Stir. Strain into a pitcher. 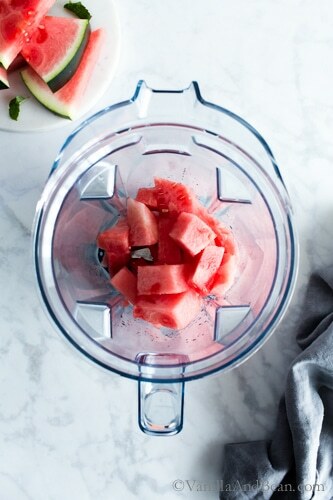 Into the pitcher, use a fine mesh strainer to strain in the watermelon puree (save the solids for a smoothie!). Stir, add ice (or add ice to individual glasses) and top with club soda. Serve right away. *For the Simple Syrup: Pour 1/2 C (120g) sugar and 1/2 C (116g) water into small saucepan and bring to a boil. Stir. Boil until all the sugar is dissolved, just a few minutes. Pour into a lidded container for storage in the refrigerator until ready to use. 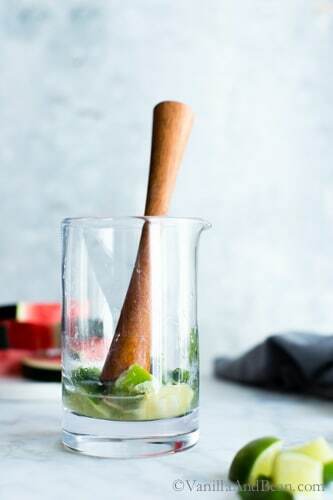 For added minty goodness, add a few sprigs of mint to the simple syrup before cooking and allow it to steep for about 10 minutes before transferring the syrup to a storage container. Because watermelon can vary widely in its sweetness, add more or less simple syrup to taste. **Watermelon can be puréed and stored in a lidded container in the refrigerator for up to two days. Happy anniversary!! 19 years is huge! These sounds so refreshing and just perfect for summer! I make a similar watermelon mojito all the time. But yours look much better. :) I wish I could have a glass with you one of these days. This WATERMELON Mojito looks so amazing Traci. Really Loved the GIF image and all the images you took. And many many many many many congratulations on your anniversary Dear. Stay blessed and Stay n Keep sharing this kind of recipes with us. Best wishes and regards. Thaaank you so much Supriya! I appreciate your well wishes and I hope you enjoy this scrumptious cocktail! These look so refreshing Traci! Perfect for the long weekend! Twenty seven years is amazing – congratulations to you both. I feel like you’re an old friend through your storytelling on this blog even though we’ve never met in person! Wishing you and Rob many more wonderful years of happiness. I wish I could raise a glass of this delicious refreshing cocktail to say cheers! I love water melon so I will definitely be trying this soon – so glad the markets now carry the small watermelons. Have a great holiday weekend. Ok, first off, I want to see your big Texas hair from the 80’s (email it to me if you need to but that’s gotta happen ;-). Happy 27th Anniversary to you and Rob, that’s really something and I love how you describe your relationship. 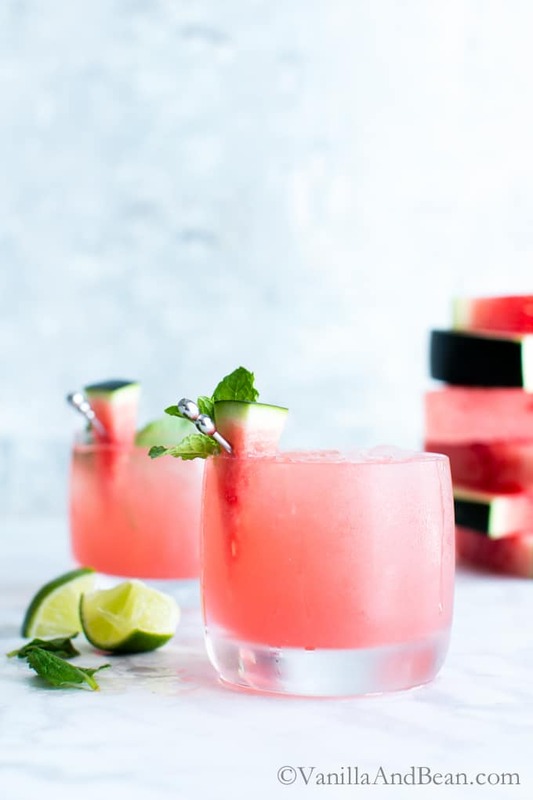 You know I am as traditional as it gets when it comes to margaritas and mojitos (the two drinks I will venture outside of wine/beer for heeheeh) but your watermelon mojito looks so refreshing and gorgeous – I would partake in a snap! Cheers to you Traci and the beautiful life you’ve created, x.
I second Kelly – we HAVE TO see at least a pic of you in that hair!!!! Happy Anniversary Traci and Rob! Thaaank you Izzy! Yeah, those photos are in a box… where they need to stay! lol! Well congratulations to you and Rob Traci! Tom and I have been married 27 years also! I LOVE your definition of marriage. You couldn’t be any more right! What a gorgeous cocktail to celebrate summer winding down and your anniversary! 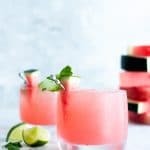 The pink color of these fabulous cocktails has me swooning! Mojitos happen to be a favorite of mine too, so I’ll be adding these to our specialty cocktail list ASAP! Hope you have a wonderful holiday weekend my friend! Soak it all in! Aw, this post was so sweet and gave me goosebumps! I can’t believe you’ve been together for 27 years. That is so very special. Congratulations! Brandon and I are going on 13 years of dating and it’s getting easier with time but man, it can be a lot of work to hold a relationship together for that long, lol! Thank you Sarah… yeah, can you imagine a hair towel in your kitchen drawer for 27 years? LOL!!! Congrats for 13 years! Something to celebrate my dear… indeed, a lot of effort, but worth it, wouldn’t you say? What a beautiful love story. 27 years! Wow. My hubby and I have only been married 19 years and it feels like no time at all. What a gorgeous cocktail and a great way to enjoy the last of the summer watermelon!